The MSDSonline Plan1 First Responder Share Service from VelocityEHS gives companies an efficient way to provide emergency response teams with quick and easy access to hazardous chemical inventory information. Through our cloud-based information sharing service, first responders can better plan, prepare and assess the risks associated with emergencies involving hazardous chemicals. Plan1 came about from a series of conversations and surveys with customers and first responders. The results were that both groups felt there was an opportunity to close the loop on emergency response planning and preparedness through improved communication and access to critical chemical safety information. The Plan1 First Responder Share Service puts hazardous chemical information at the fingertips of those who need it most — emergency responders. Given the nature of their work, first responders are at particular risk of occupational injuries and illnesses, including those caused by exposure to chemical hazards. In the fire community alone, more than 19,200 firefighters were exposed to such hazards in 2012, according to the NFPA. As an MSDSonline customer, you’re already doing your part to streamline compliance and improve workplace safety. Now, with Plan1, you can go one step further — you can close the loop on hazardous chemical safety and help 'serve and protect' the very people who dedicate their lives to serving and protecting you. The Plan1 First Responder Share Service is available for free to MSDSonline HQ and HQ RegXR customers. It allows for the seamless distribution of hazardous chemical information to first responders, who are all-too-often forced to address emergencies without access to a clear and accurate picture of potential on-site chemical dangers — a problem solved with Plan1 share. Getting started with Plan1 is simple. Just enter your emergency responders’ contact information and then choose to share any or all of the following: safety data sheets, indexed product summaries, facility floor plans and chemical container maps, and chemical inventory lists. The Plan1 service does the rest. It emails your first responders a link to your secure, up-to-date and potentially lifesaving hazardous chemical information. It’s that easy! When emergencies strike, you’re the first to arrive on the scene. With little time to waste, you can be left assessing risks and developing emergency response plans with outdated or inaccessible information, the result of which can be devastating, especially if hazardous chemicals are involved. Take, for example, the West, Texas fertilizer plant explosion, which decimated a community and injured and took the lives of many, including first responders. To help prevent the recurrence of tragic incidents like this one, MSDSonline developed Plan1, a cloud-based sharing service that gives emergency responders immediate access to participating customers’ hazardous chemical information, which is helpful to have on-hand throughout the emergency planning and preparedness process. 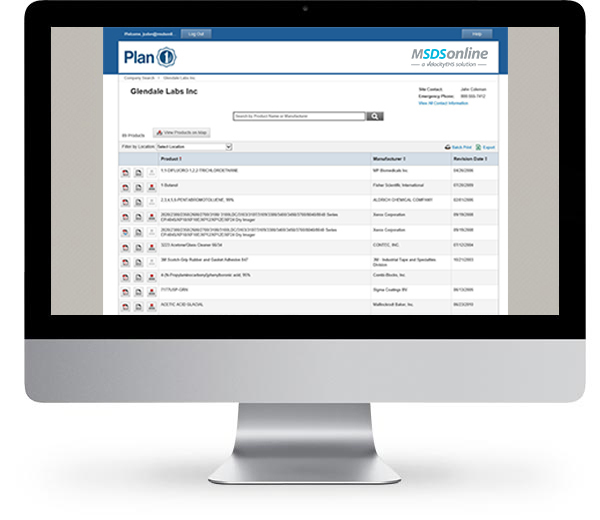 Because Plan1 is an online service, you, the first responder, always have around-the-clock access to company-specific chemical safety information, such as facility floor plans and chemical container maps; chemical inventory lists; and safety data sheets, which contain critical fire-fighting, first-aid and spill-response information. Accessing this potentially lifesaving information is easy. Once an MSDSonline customer elects to share with you, you'll receive an email containing Plan1 log-in instructions, which you can use to retrieve the shared information anytime from any device with an Internet connection — for free. It’s that easy!